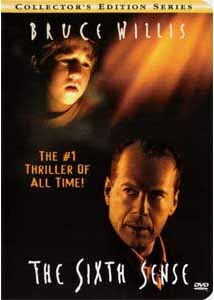 The Sixth Sense was one of the big box office hits of 1999, and it features no big explosions, a minimal number of special effects, and only one big star. It succeeds merely on character interaction, stylish direction, and an intelligent and incredibly clever script. This film should have won the Oscar® for best original screenplay, because nothing else I've seen in theaters in years has come close to it. Willis actually gets to exercise his acting chops a little here, instead of coasting in his usual action hero role. In this film, he is cast as Dr. Malcolm Crowe, a renowned child psychologist who attempts to get to the bottom of what is terrifying young Cole Sear. In return Malcolm gets a startling revelation about life after death, and the unhappy lot of spirits that wander the earth, only visible to certain sensitive persons—such as Cole. While individually both Willis and Haley Joel Osment give terrific performances, it is the interaction between the two that really crackles. One of the most unforgettable scenes of the film for me is the game that the two play as Dr. Crowe attempts to win the confidence of the frightened boy. The cat and mouse of their respective thoughts is visually communicated on their faces; the use of a subjective camera to mirror Cole's attitude, going toward and away from Willis as the game progresses. This is a tour de force for both of the actors and the director as well. Much of the film is carried by the character interactions, such as between Crowe and Cole, and Cole and his mother. Contrasted with these interactions are the complete lack of communication between Crowe and his wife, as Crowe sees her slipping away from him. At the same time, Crowe is obsessed with helping young Cole, since he had failed a child patient in similar circumstances some ten years earlier, and wants to make good on this earlier failure. As mentioned above, the script is highly clever and works extremely well; the film demands at least two viewings for reasons that will be apparent at the end. DVD allows the visuals to be savored and inspected closely in a manner that the theater does not permit; thankfully the movie stands up well to close scrutiny. I watched the film three times in quick succession in preparing for this review; I must say that I liked it more and more each time. Image Transfer Review: Overall, this is a good-looking disc. The picture is a little soft, even in anamorphic mode, but this complements the mood of the film rather well. The dual layer disc gives plenty of room for a high bit rate that is used to good effect. The color red plays an important part in the symbolism of the story, and the reds come through well saturated but not smeary or over saturated. Other colors tend to be a little muted, but this is clearly an intentional part of the art direction. The lighting is subtle and almost always gorgeous. No artifacts were visible. There is little to complain about here. The trailers are non-anamorphic. Audio Transfer Review: The English and French language tracks are both presented in Dolby 5.1. There is little to no subwoofer activity, and the surrounds are mainly used for James Newton Howard's atmospheric music. This is not a loud high-octane film, so one might think that the 5.1 really almost seems unnecessary. However, the sound design effectively uses the low level sounds of breathing throughout the entire picture, which is practically unnoticeable unless you know about it, but this simple effect helps lend an air of unseen presence to the film. The opening titles are slightly hissy, but the hiss goes away once the film proper begins. The beginning trailers are presented in Dolby Surround, rather than 5.1, although they probably would have benefited from a 5.1 mix. The French dubbing appears adequate, but no French subtitles are provided. Audio cannot be selected on the fly, but you must return to the main menu to change language tracks. The menu design does, however, permit you to resume the film at the same place, should you wish to change language tracks. Extras Review: This disc is jam-packed with extras that contribute highly to enjoyment of the feature. Afterwards, be sure to visit the series of interviews with the director, M. Night Shyamalan, for highly interesting background on the film and references to a great many tidbits that you probably missed on the first viewing. Do not watch these interviews first, as they contain spoilers that will ruin the movie for a first-time viewer. It would have been nice to have a feature-length commentary, since this film and its script are so dense, or a subtitle commentary pointing out these items, such as the one provided on the Abyss DVD. There are several deleted scenes that were probably rightly removed from the film, but give us a view of Cole's interactions with others that we don't see in the final picture. They would have slowed the film down terribly, however, and were properly cut. The director gives a brief introduction to each deleted scene to put it into context. The notes on the cast and crew suffer from a silly design flaw. Every time you select a member of the cast, you first have to go through the instruction screen. This is unnecessary and becomes highly irritating if you go through the lengthy credits provided. It would have been much better to give the instruction screen before presenting the menu of cast and crew. No filmographies are provided beyond those films mentioned in the text of the biographies; I for one would have liked to have seen a fuller listing of the other films these folks have worked on. There is a hidden feature, a home movie that the director made when he was all of eleven! We only have a crude 90-second excerpt here, but it's amusing to see the beginning of what is sure to become a major talent in the film world. To find the film, go to the second page of bonus materials and hit enter on the red-wrapped cigar box. It's always nice when the special edition clearly bears the fingerprints of the director of the film. Shyamalan clearly enjoyed working on this DVD and put together a super package. Had there been a feature length commentary, this disc would have earned a very solid "A" grade. Buena Vista, the distributor, has added five trailers that automatically play before you can get to the main menu. You can avoid them by hitting stop right after the FBI warnings, and then hitting the DVD menu key. Alternatively, you can use chapter skip to proceed to the next trailer, but at least on my Sony player, you have to allow each one to start before you can do so. This is an irritating design flaw that hopefully will be remedied in future releases. Oddly enough, the reverse and skip back keys are disabled during the trailers. Does Buena Vista not want us to look at any of the trailers individually? The indicator on my Sony also mysteriously states that there are two angles; however, exploration failed to disclose the actual presence of more than one angle. The Sixth Sense is a wonderfully atmospheric throwback to suspense thrillers of yesteryear, with a script that will leave you thinking for days. This film bears—even demands—repeated viewings and does not disappoint. This nicely supplemented disc is very highly recommended.